RottenTomatoes.com, the movie review aggregation site, has confirmed what most of us already know: “The Hurt Locker” and “Up” were two of 2009’s freshest movies. But when it comes to video game adaptation “Street Fighter: Legend of Chun-Li”? The moldiest movie of the year, with a truly rotten 4 percent freshness rating. The movie review Web site released its picks for best reviewed movies this morning – voted on by an RT list of film critics - and there were some consistent favorites. Disney Pixar’s animated “Up” took the Golden Tomato for best-reviewed film in wide release, and Kathryn Bigelow’s “The Hurt Locker” nabbed the golden piece of produce for best-reviewed feature in limited release. Both movies were just a few points shy of being 100 percent fresh on the Tomatometer. The accolades for “Up” aren’t a huge surprise, since RT.com critics seem to really love their cartoons. In the 11 years the site has had the Golden Tomato awards, animated features have taken the best-reviewed film in wide release title eight times. “The Hurt Locker” also won the title of “best action/adventure film in 2009,” prompting director and producer Bigelow to extend a heartfelt "thanks" to the Web site. “I’m grateful for your support of the film and am delighted that you have deemed it fresh,” she said. “Star Trek” producer J.J. Abrams, on the other hand, was “thrilled and honored to be determined ripe” by the site. By winning the “best sci-fi film in 2009” title, “Star Trek” cut off “Harry Potter” from being the most lauded franchise in Golden Tomato history. It’s not a bad predictor of what’s to come at the Oscars either: Since 2001, the Golden Tomato winner in the animation category has also taken home the Oscar for best animated feature six times. After reading several of the comments here, I think a Film that definately deserves its recognition from Pixar is "Cars." Though the cars looked like those used in the Chevron ads a few years ago, the film was very well done and in my opinion completely fresh with Chracters that were not human based but that of machines. Though I could definately see the twist on the NASCAR theme. But regardless it was a nice twist, in fiact my wife and I enjoyed it as much as the Incredibles, both of which we own on DVD. A very nice change last year was the WALL-E, which also landed in our collection of Pixar films. But on a different note I would also like to mention a couple of Anime films that some of you may not have had a chance to look at. For those of you who have children, you may want to choose to make these adult oriented flicks mainly because of content. For those of you who may have not seen these, they are at least worth a one time through. I think it was a weaker year overall for "prestige" pictures, but I really think "Up" deserves Best Picture of the year. Along with Up, Ratatouille and The Incredibles are my favorite Pixar films, but all are fantastic, really. "Up" is an exceptional film in a lack-luster year, and in a 10 nominee race, anything is possible. Go, "Up!" Have to say that my favorite Pixar movie is Ratatouille. RE Flabtastic's comment to Moviefan - I second that. You appear to delight in belittling what the majority find entertaining. 1st Amend is in force, but you're a sad minority. This version of star trek was less painful than the First movie with Stephen Collins...now that movie was painful! Flabtastic to moviefan, I second that observation. Lmao. I am quite glad that Avatar got nothing. That is probably the most over-hyped movie of all time. Let's be fair here – both of Aardman's productions are on here as well: Chicken Run and Wallace and Gromit. While obviously fewer movies were released by them, they still are 2 for 2, beating out even Pixar's movies for those years. Still loved "Up" though. It deserves the Best Picture Oscar, but won't get it due to stupid politics. moviefan: let it be known to all that based on your comments you lost your connection to planet earth years ago. "Up" was a huge disappointment. The weakest offering from Pixar yet. Hope this one was just an outlier and they get better soon. WALL-E should have taken movie of the year. I am glad to see the Hurt Locker recognized. It was a riveting movie. The actors and director deserve to be lauded. With all its technical brilliance, I still think Avatar is an over-hyped, over-simplistic, poorly scripted tale of a White Saviour in a foreign land. It's "Transformer Smurfs Meet Tarzan In Outer-space." So six of those belong to Pixar. I think the proverbial hat has to be taken off for Pixar and the geniuses behind claymation that works, not critics that have some sort of bias for animation. 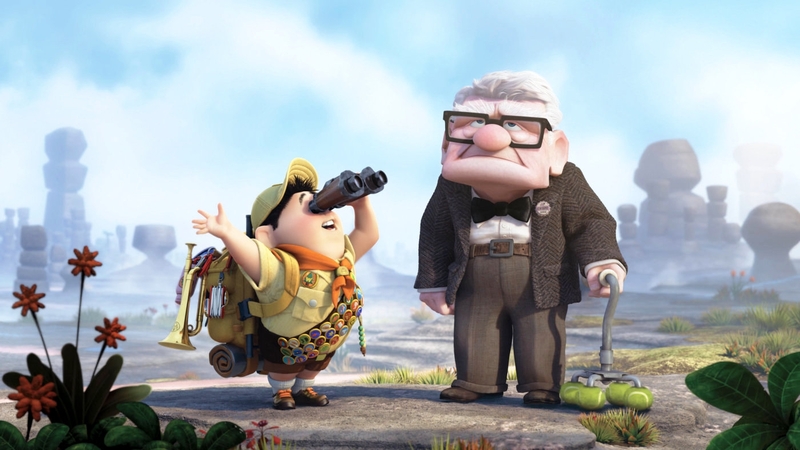 As for this year, I'm glad to see that "Up" got the credit it deserved, but I don't think it was Pixar's best. I think the first forty minutes of "WALL-E" are some of the greatest minutes in all of cinema. I am hoping for the hybrid movie "Drag Me UP to Hell In a Hurt Locker" Now that would be a movie for the ages! As soon as they mentioned 'Star Trek' this site lost all credibilty. I don't get it. I am a fan of Trek, but this one was tearfully horrible. And if 'UP' is as bad as Wall-E, the other Pixar everybody raved about, I guess I just have to accept that I have finally lost my connection to planet earth (and please don't get me going on Avatar). Honestly this wasn't the best year for films to begin with. I would be able to find more than a fair share of rotten ones the ripe ones so to speak. Glad to see "Up" getting its due. Not Pixar's best, but that's like saying Beethoven's 7th wasn't his best. The 5-minute, wordless montage of Carl and his wife near the beginning is achingly beautiful.